Visionary Projects is hosting my Powerful Design/Personal Color Workshop! CLICK HERE for more info and to register! Spots will fill quickly. Powerful Design/Personal Color, 214-405-5993. (Full) Please contact Bonny Leibowitz to be added to the waiting list. October 18-26, 2019, Oaxaca City, MEXICO (pronounced, "WAHAKA"), BELLISSIMA ART ESCAPES - "Culture" + "Life Experiences" + "Food" , Oct 18-26, 2019; contact Kathie Vezzani for more information. *On July 31, 2016, our home and my four studios burned to the ground. We had 45 minutes to leave our home and although we thought we might return, by the time we were allowed back after four days of continuous burning, there was literally nothing but ashes left. 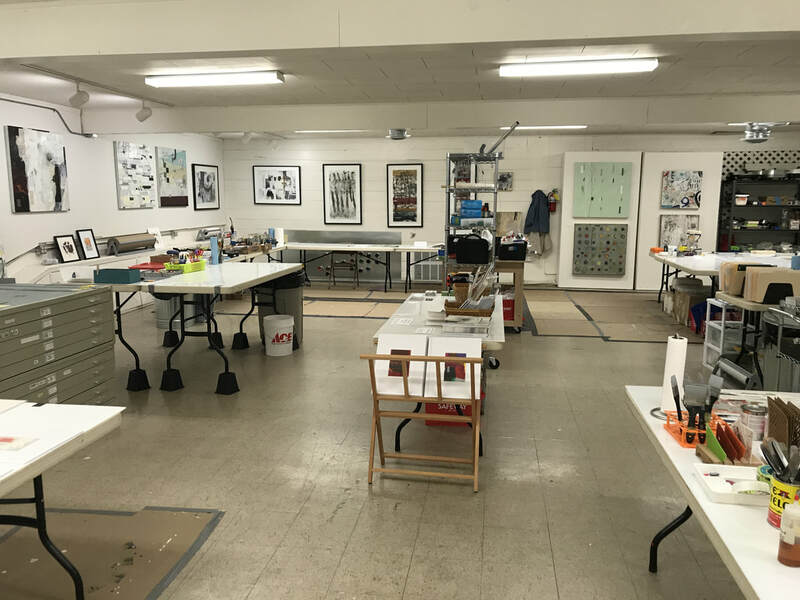 Fortunately, I had insurance which allowed me to temporarily rent my current studio, and many artists here and across the country generously donated art supplies and support, so very much appreciated. It took nearly 6 months to resupply every pencil, ruler, paper towel and the four mediums I work in, but now that it is finished, I want to share this space by teaching here. 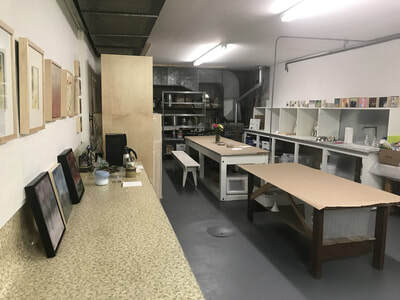 This 2800 sq ft studio has excellent ceiling ventilation throughout, daylight corrected fluorescent lighting, large wooden walls to hang cradled panels or large sheets of paper, and GFCI (Ground Force Circuit Interruptor) outlets to prevent overloading electrical circuits while painting with encaustic or encaustic monotype. My studio is also equipped with a Roland Pro Box (32x44in) for encaustic monotypes. There is a nice back area with a large table for having our lunches, with a sink and refrigerator, microwave, coffee maker and Forman grill. The nearest airport to my studio is the Missoula, Montana airport. 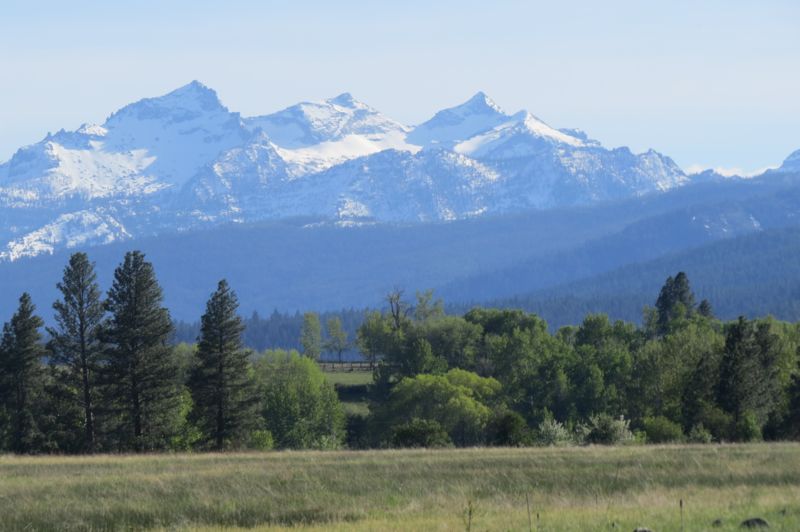 The studio is located at 1436 S. 1st street in Hamilton, MT. 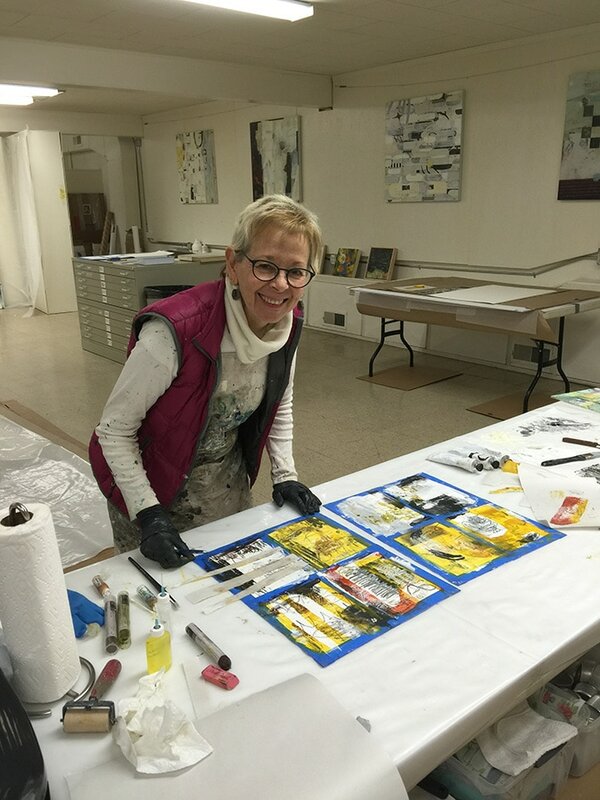 2 days making art in my Hamilton, MT state of the art studio! 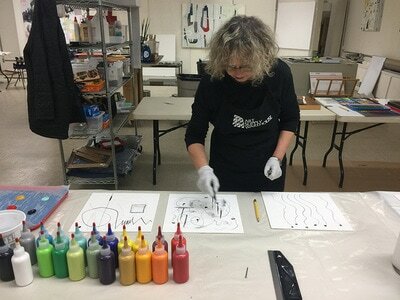 Explore medium(s) of your choice (encaustic, encaustic monotype, acrylic/mixed media, cold wax/oil). Not included: Transportation and evening meals. 3 days making art in my studio! OR......WOULD YOU LIKE ME TO COME TO YOU? If you would like me to visit your area (group, private or semi-private instruction), please fill out the form below and specify this in the comment box. It may be feasible for me to come do a workshop in your area, but the most important thing is to have an adequate venue in mind! If you already know of a light filled, spacious venue which supports art workshops, please mention that as well in the comment box, along with the main contact person if possible. “The time I spent with Pam was a gift from above. I felt such a good connection with an an amazing artist. She has mastered the art of communication – and is not afraid to share; she wants to help artists open their creativity. 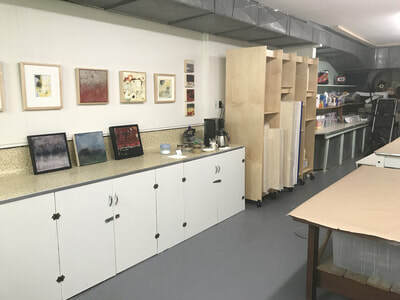 This experience was a warm welcome into my life- she opened her studio – shared her materials, knowledge, guidance and I experienced such joy – two artists together. She helped to open my heart to offer my creativity to people and now people want to buy my art but I tell them “not for sale-yet!” She has opened a path for me; her teaching is limitless and opens more possibilities." "Pam is an inspiring workshop leader, combining her skills as artist, teacher, observer, critic and cheerleader to help others take their art to a new level. She's insightful and analytical while also creative and passionate. Throughout, Pam shares new ideas, techniques and approaches and then allows participants to experiment and explore. 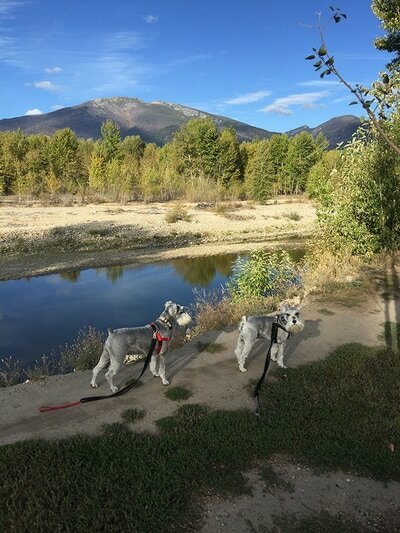 I left my first workshop inspired and enthused about my art and the possibilities that await." To inquire about instruction/consultation/workshops/mentorships - please fill out this form!